Every October is Car Safety Month when the industry works together to help Canadian car owners prepare for winter driving. Preparing ahead of time before the temperature drops can ensure small problems are fixed and wear and tear from long summer drives are resolved. By teaching Canadians about pre-winter inspection and maintenance needs, we can help to keep them safer on the road, avoid collisions, and prevent them being stranded in harsh winter conditions. 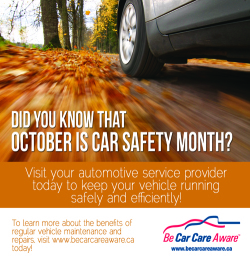 In October, Be Car Care Aware promotes car safety by writing articles on fall maintenance needs, sharing car care tips on Twitter and Facebook, partnering with like-minded organizations to encourage Canadians to have their vehicles inspected, promoting the use of winter tires and helping industry members like you to share the car care message with your customers. Promote Car Safety Month on your website, via social media, and in your shop. Run an ad in your community newspaper, on your local radio station or on TV to promote your company and Car Safety Month. Run a special in October for Car Safety Month to get people into your shop. There are lots of ways that you can use Car Safety Month to help drivers in your community understand why maintenance is important and why they need to proactively prepare for winter driving. And presenting yourself as a source of information as well as service will help to promote your company image and build trust with current and potential customers.